What if we promise to give you a piece of Italy? It sounds like we are binding you in a spell of rhetoric expressions, but technically it is possible with our novel range of Italian wardrobes. Whether you are aiming for sliding or hinged door wardrobes that can be fitted in your bedrooms or your living space, we bring forth a broad and myriad variety that boasts of our passion in creating art with wood and other kinds of materials. What makes our wardrobes special? 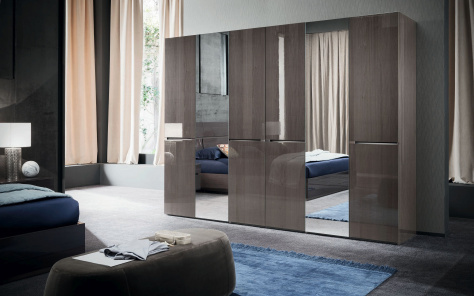 While wardrobes are an essential addition to your existing furniture for storing clothes and other materials while also aiding to re-organise your space, our vast range of Italian wardrobes are pieces of art that will add to your existing decor. One can find our extensive collection of wardrobes in various finishings, styles and elaborately designed accessories. Available in all kinds of materials, they are fitted with uniquely fashioned mirrored doors and shelves that can be adjusted to make space, when needed. Our customers define our wardrobes as nothing short of architectural pieces synonymous with resplendence and grandeur. With an unlimited choice of colours and styles available on our website, all you have to do is to browse through the various images shared and choose the one that fits your style and need. Each wardrobe that we sell is an extension of our creative artists’ imagination that assumed a definite shape, thanks to the relentless efforts of our skilled craftsmen. In addition, recommendations and reviews of our customers enlighten us on the designs that they prefer for everyday use. Apart, we have bespoke luxury wardrobes for our most passionate and opulent buyers. Looking to add furniture to your place? Come and shop at Denelli, where we promise nothing but the best. You may view the product listings on our website or come to our showrooms for a detailed understanding and purchase.